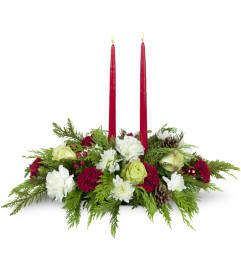 The FTD® Holiday Elegance™ Bouquet is a stylish way to express your love and wonderment for the Christmas season to your special recipient. 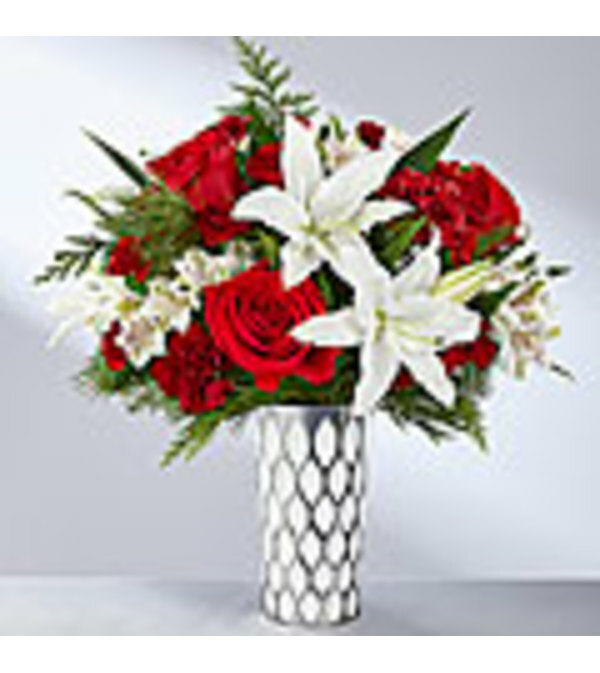 As magical as the first snowfall, this stunning fresh flower arrangement brings together rich red roses and carnations with burgundy carnations and mini carnations to create a sense of drama when paired with showy white LA Hybrid Lilies and white Peruvian Lilies, all accented perfectly with fragrant holiday greens. 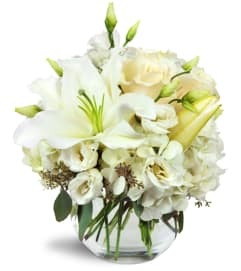 Presented in a modern white glass vase with an attractive layered feathered design throughout to add to the texture of this piece, this Christmas bouquet is a wonderful way to send our season's greetings to friends, family, and co-workers this holiday season.